Cat Loves the Dodgers shares her pics from last nights game, here. Audio: Executive Access via MLB.com -- Friedman talks journey from finance to Rays to LA (Audio Link). Podcast: True Blue LA -- Podcast episode 1812: Dodgers 2018 draft review with David Hood (Podcast Link). 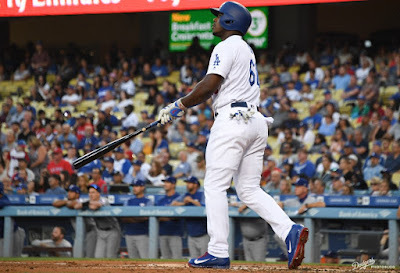 Podcast: Dodgers Nation -- Ross “Mad Dog” Stripling | Episode 6 | Blue Heaven Podcast (Podcast Link). FYI, the Fourth Annual Los Angeles Dodgers Foundation Blue Diamond Gala was a big success. According to a press release there were 1,700 attendees and it raised over $2.2 Million. In case you don't now, the Second Annual Yasiel Puig Celebrity Poker Tournament is on Thursday. It will be held in the Dodgers Stadium Club. Go here for more information. An MRI revealed Walker Buehler has a microfracture in his ribcage. Manager Dave Roberts said Buehler’s 10-day DL stint is backdated, so he’ll be eligible to return in a week but could need a couple weeks. Via Fabian Ardaya at The Athletic (subs. req. ); "‘A nice little day’: How Andrew Shaps, once all but out of baseball, became the Dodgers’ 31st-round pick." Awesome! There's nothing like listening in on a coach arguing with an umpire. Per a Reddit post via u/meteorblade we witness Mets manager Terry Collins getting heated with the umpires after Noah Syndegaard is tossed out of the game for throwing at Dodger "Dad" Chase Utley. This occurred on May 28, 2016 -- you'll remember that this was one of Utley's greatest game as a Dodger. He hit two homers against the Mets - a solo shot in the 6th and then a grand slam the next inning.